Make in India, Favola Strives to be ECO-FRIENDLY and is commited to protecting the fragile environment in India. The glass bottle is reusable thus avoiding the waste disposal of Plastic bottles every day. 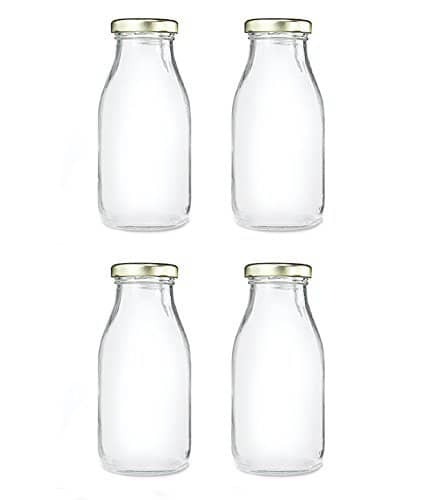 4 Pc Glass Bottle with capacity of 300 ml water. Best use for Water, Milk, Juice, Oil, Wax etc. Water Bottle with Air Tight Rust-Proof Golden Color Cap to provide you most healthy drinking experience. Freeze safe glass Bottle to keep your water, milk, juice safe and to avoid use of plastic. Store beverages in style. Packed in world class inflatable packaging for safe shipping.